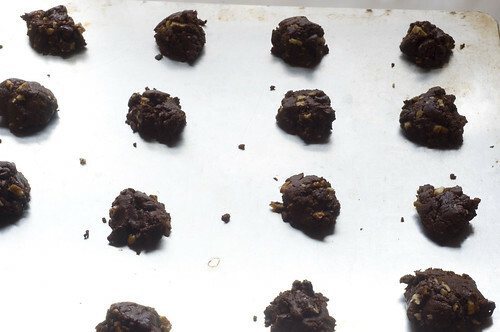 These cookies taste like the crispy edges of the best brownies ever, but better because the chewy/crispy part isn't just a portion of the treat, but the entire thing. 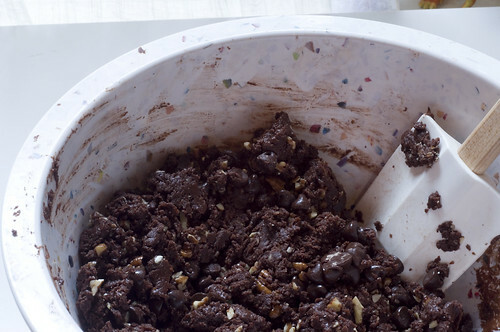 Honestly, I'm not normally a fan of brownies, but these cookies are like the best brownies I've ever had. 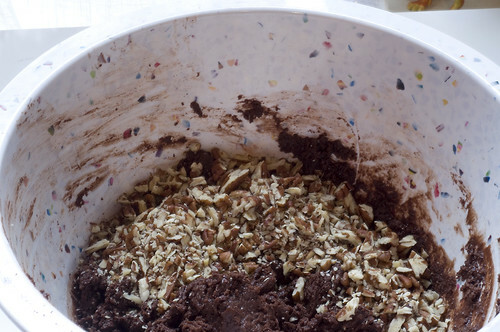 The have just a thin moist layer in the middle, and are chock full of nuts and chocolate chunks. 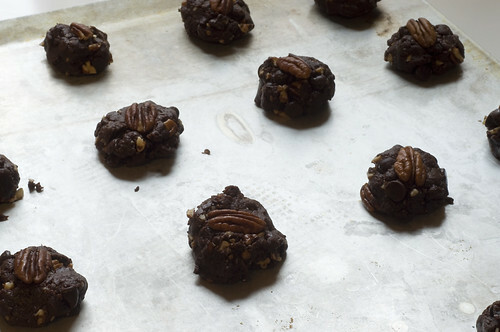 Honestly, these might be my new favorite super-fast-'n-easy cookie. 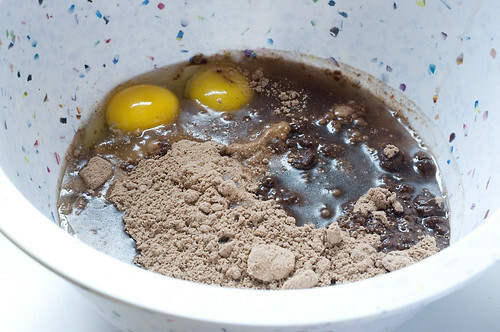 The main reason they're so fast and easy is because of (you guessed it) my gram's love of cake mix. She says to use Dunkin Hines, and gives you the option of two different chocolate cakes; I went with the Devil's Food. As usual, I'm sure whatever brand you like will work out just fine. She also says you have to top them with pecans, but I doubt that it will be the end of the world if you prefer to use walnuts. 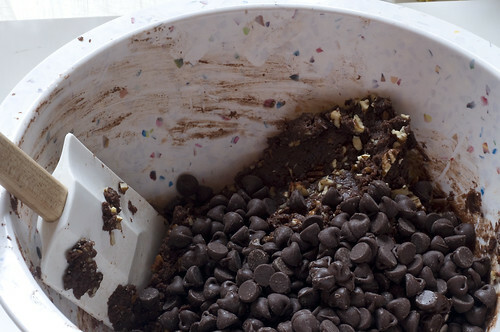 Mix all the ingredients together in a large bowl, folding in the nuts and chocolate chips last. 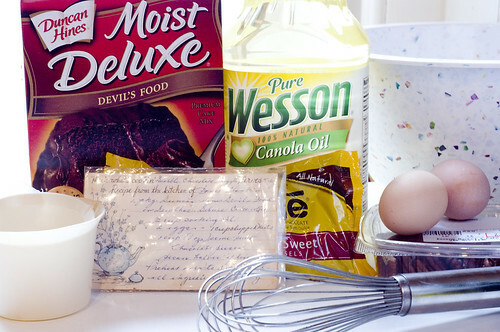 Drop by the teaspoon full on to an ungreased baking sheet. The dough didn't want to stick together as well as I liked on its own, so I ended up smooshing it in to balls using my hands half the time. 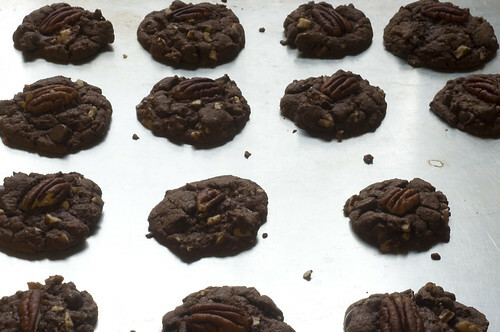 Top each cookie with half a pecan. 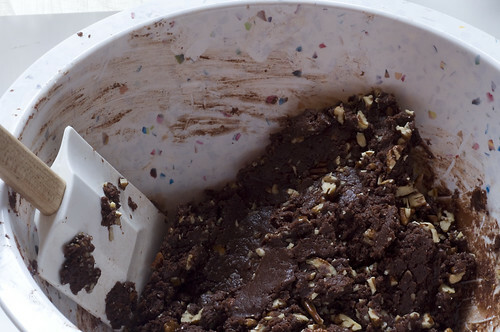 Allow to cool on the baking sheet for 1-2 minutes, before transferring to a rack to finish cooling. 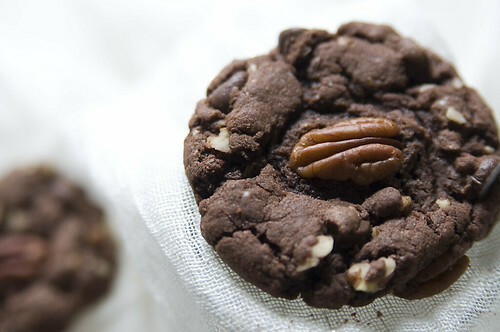 These cookies are so good and chocolaty. 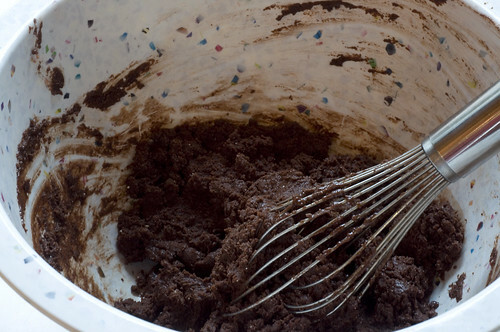 I never ever ever have the urge to eat raw batter (I don't even like cookie dough ice cream), but this smelled so good even before it was baked that it was hard to resist just eating it out of the bowl. I can't wait to dunk these cookies in some milk. thanks for the recipe! made these today and they are good..it makes quite a lot though!